Salford Royal NHS Foundation Trust is harnessing robot technology to dispense medicine quickly and safely. Following a successful trial on the hospital’s Pendleton Suite ward, the PillTime programme has been extended into the 29-bed community facility at the Heartly Green Immediate Care Unit. PillTime is a fully-functional dispensary, featuring a robot and optical checker which has been set up in the global digital exemplars (GDE) pharmacy department. The robot collates differed patient medication and dispenses it in individual, sealed pouches in the order it needs to be taken. Each package is then checked by advanced image recognition technology as well as pharmacy colleagues to ensure the highest level of accuracy. To eliminate confusion, each pouch is clearly labelled with the name of the patient as well as the day, date and time the dose has to be taken, the description of the tablet and the expiry. 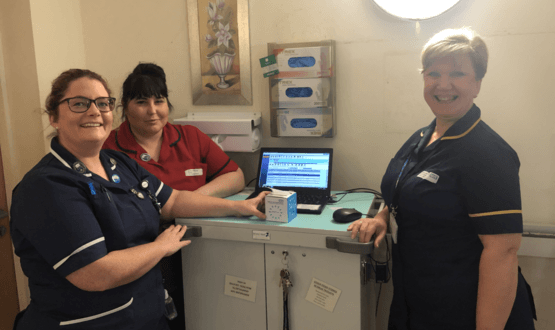 The PillTime project went live for the first time just before Christmas and, though in its infancy, has delivered a number of key benefits including; improvements to dispensing accuracy; fewer medication errors; timely administration to patients; and reduced missed doses. The tablet information on the pouches also makes it easier to cross references against the in-house electronic patient record. Nurse Nadine Keats, who works on the Pendleton Suite, said the project saved her 30-40 minutes in every round she completes. “The PillTime pouches have made for an efficient drug rounds, a more calm and relaxed atmosphere on the ward, and also enabled tidier and more manageable trolleys,” she said. The GDE is currently finalising plans to roll PillTime out to a second community facility at the Limes Intermediate Care Unit. Salford’s GDE and Future Digital teams are canvassing the experiences of frontline staff as part of the formal evaluation of the programme. It’s hoped these views will give them first-hand insight into the future potential PillTime can be maximised – potentially across the entire NHS. Another digital project, the trust announced in March 2019 that it had deployed paperless anaesthetic records. Implementing full barcode medication administration in the UK is challenging without changes in the way pharmaceutical companies manufacturer, package and distribute medicines. I had seen this implemented with HarrisHealthcare EPR 5 years ago.